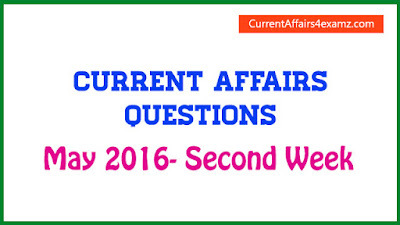 Hi Aspirants, Here are the Important Current Affairs Questions from the second week of May 2016 useful for all upcoming competitive exams. 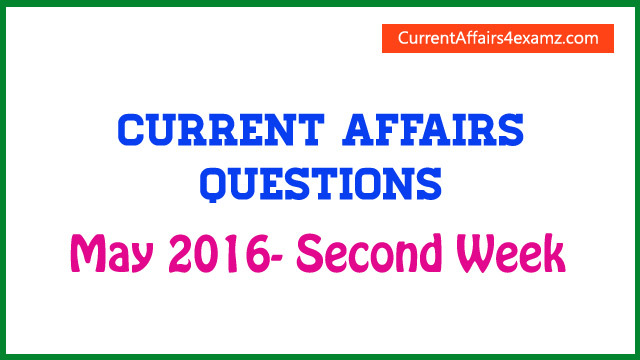 We have covered all the important happenings of the week keeping in mind all the upcoming exams like Civil Services Exam 2016, SBI PO 2016, SBI Clerk 2016, University Assistant Exam 2016, SSC CGL 2016 Tier-1, SSC Stenographer Exam, SSC CHSL 2016 etc. You can download the PDF from the below link. Note: Manohar is the first elected independent Chairman of the Cricket governing body and will serve for two-year term with immediate effect. Note: The theme for celebrations of the Technology Day 2016 is Technology enablers of Startup India. The day commemorates the anniversary of first of the five tests of Operation Shakti (Pokhran-II) nuclear test which was held on 11 May 1998 in Pokhran, Rajasthan. Note: In the final played in Rome, third-ranked Murray defeated the top-ranked Djokovic 6-3, 6-3. 9) President Pranab Mukherjee on 11 May 2016 signed the warrant for the appointment of four judges to the Supreme Court. Name them? Justice AM Khanwilkar of the Madhya Pradesh High Court, Justice DY Chandrachud of the Allahabad High Court, Justice Ashok Bhushan of the Kerala High Court and L Nageshwar Rao. Note: With this sworn-in event, the judicial strength of the Supreme Court will move up to 28. Note: It was launched from the complex of Abdul Kalam Island (formerly known as Wheeler Island) off Odisha coast.